When the pilgrims boarded the Mayflower in England in the 17th century, they hoped their journey would lead them to a ‘new world’, a fresh start and an escape from the death, disease and other maladies in England. 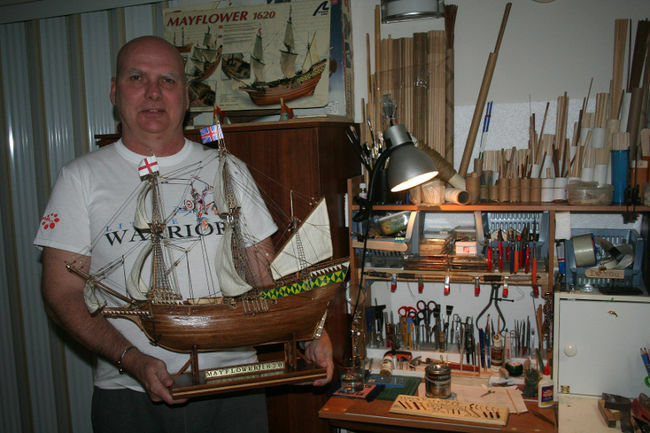 Leduc resident Ian Brett had a similar concept and idea in mind as he began the tedious and long process of building a Mayflower model ship from scratch. As a survivor of sexual abuse as a child, Brett wanted to donate something towards the grand opening of the Little Warriors Be Brave Ranch that would be symbolic of a fresh start. “I felt the Mayflower ship really symbolizes what this ranch means to abused children and their families,” explained Brett, who initially resided in Leduc in 1974 and then made his way back to the city last December. As part of its vision, the organization recently opened its Be Brave Ranch – a treatment centre for sexually abused children and their families in central Alberta. It is the only such treatment centre in Canada. Brett attended the official grand opening on Saturday, Sept. 27 to donate his handmade Mayflower model ship, which took more than 5,000 hours to complete. Brett said he estimates the work would be worth a $25/hour service, totalling nearly $120,000. 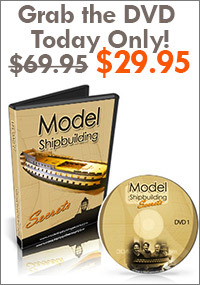 Every single piece constructed on the ship was done to mirror the detail of the actual Mayflower, said Brett, who is part of the Historical Ship Building Society in the United States and Maritimes. Brett joined the Little Warriors Foundation as volunteer four years ago and since then, he says, it’s changed his life and allowed him to lift the burden of sexual abuse off his shoulders he experienced as a child. “Being able to speak with others who have been through the same thing in an environment that’s really easy to do so, has been monumental in bringing change to my life,” explained Brett. Without this outlet, Brett said he’s unsure where his frame of mind would be. Carrying all the emotions of sexual abuse for more than 30 years affected all aspects of his life. “This organization really teaches how to break the chain of sexual abuse and I believe that’s the single most important aspect of this. Nine times out of 10, the child knows their sexual abuser. For a predator it’s all about having the power, so to break that is so important,” said Brett. The experience of volunteering has not only changed his life, but also one of his relatives who also experienced sexual abuse at the hands of a family member as a child. “For both of us, it’s allowed us to learn, grow and lift all the negative emotions that come from sexual abuse,” said Brett. Donating the model ship isn’t Brett’s only contribution to the Little Warriors. He’s volunteered for the organization for many of it’s fundraising events, which included the LPGA tournament hosted in Edmonton four years ago, numerous Edmonton Eskimo games and many more events. And he doesn’t plan on stopping anytime soon. “As long as I physically can do it, I’ll volunteer,” said Brett.